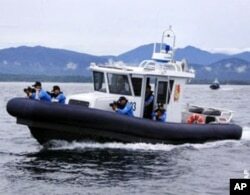 Special Boat Unit crews take part in an ICITAP training mission at Honda Bay, Philippines. The U.S. Department of State works with committed partners to combat transnational crime and corruption through its diplomatic initiatives and training programs. The increased sophistication and ruthlessness of today's criminal networks, as well as the harm caused by crimes such as trafficking in narcotics, arms and people, demand greater international cooperation among the law enforcement officers. The U.S. Department of State works with committed partners to combat transnational crime and corruption through its diplomatic initiatives and training programs. The U.S. Department of Justice through the funding and authorities of the State Department, initiated the International Criminal Investigative Training Assistance Program, or ICITAP in 1986. Its mandate is to implement law enforcement training and assistance programs in countries designated by the U.S. Department of State, and assist them in developing professional law enforcement capacity. The aim is to increase their capabilities to conduct effective law enforcement functions, including fighting transnational crime, terrorism, and corruption. To date, the U.S. Department of State has funded ICITAP activities in training law enforcement personnel in 38 countries. Of these, 3 are in the Asia-Pacific region: Indonesia, Thailand and the Philippines. These 3 countries have a lot of common concerns, since trans-national crime and counterterrorism are major considerations for that part of the world. ICITAP training involves everything from fundamental skills, such as how to conduct investigations, the proper way to collect evidence and nonviolent methods for controlling civil disturbances. And in each country, the training is part of a long term development program. For example, ICITAP has led the Police Assistance Program for the Indonesian national police, which has the monumental task of guarding the country's 17,000 islands. In Thailand, ICITAP conducts training programs for the Royal Thai Police, complementing other U.S. assistance. In the Philippines, ICITAP has helped the 200,000 strong Philippine National Police force accomplish top-to-bottom structural reforms, as one component of an overall U.S. assistance strategy to the Philippines security sector. The job of Philippine law enforcement officers is a difficult one. They are responsible for guarding their country's 7,000 islands and over 35,000 kilometers of coastline. The U.S. recently donated to the Philippine National Police Maritime Group’s Special Boat unit, 4 police patrol boats to assist their work. "Policing the maritime environment is vital not only for domestic security, but regional and even global security," said U.S. Ambassador to the Philippines Harry Thomas. “A strong and sustained maritime policing capability will safeguard the security of all."